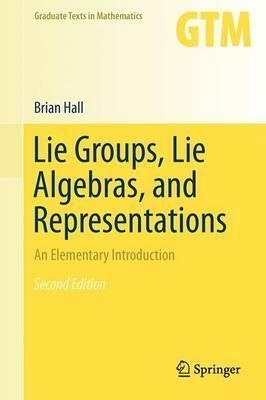 This textbook treats Lie groups, Lie algebras and their representations in an elementary but fully rigorous fashion requiring minimal prerequisites. In particular, the theory of matrix Lie groups and their Lie algebras is developed using only linear algebra, and more motivation and intuition for proofs is provided than in most classic texts on the subject. The second edition of Lie Groups, Lie Algebras, and Representations contains many substantial improvements and additions, among them: an entirely new part devoted to the structure and representation theory of compact Lie groups; a complete derivation of the main properties of root systems; the construction of finite-dimensional representations of semisimple Lie algebras has been elaborated; a treatment of universal enveloping algebras, including a proof of the Poincare-Birkhoff-Witt theorem and the existence of Verma modules; complete proofs of the Weyl character formula, the Weyl dimension formula and the Kostant multiplicity formula. This is an excellent book. It deserves to, and undoubtedly will, become the standard text for early graduate courses in Lie group theory ... an important addition to the textbook literature ... it is highly recommended. Illustrations note 72 Illustrations, color; 7 Illustrations, black and white; XIII, 453 p. 79 illus., 72 illus. in color. The second edition of Lie Groups, Lie Algebras, and Representations contains many substantial improvements and additions, among them: an entirely new part devoted to the structure and representation theory of compact Lie groups; a complete derivation of the main properties of root systems; the construction of finite-dimensional representations of semisimple Lie algebras has been elaborated; a treatment of universal enveloping algebras, including a proof of the Poincaré-Birkhoff-Witt theorem and the existence of Verma modules; complete proofs of the Weyl character formula, the Weyl dimension formula and the Kostant multiplicity formula. "This is an excellent book. It deserves to, and undoubtedly will, become the standard text for early graduate courses in Lie group theory ... an important addition to the textbook literature ... it is highly recommended." Part I: General Theory.-Matrix Lie Groups.- The Matrix Exponential.- Lie Algebras.- Basic Representation Theory.- The Baker-Campbell-Hausdorff Formula and its Consequences.- Part II: Semisimple Lie Algebras.- The Representations of sl(3;C).-Semisimple Lie Algebras.- Root Systems.- Representations of Semisimple Lie Algebras.- Further Properties of the Representations.- Part III: Compact lie Groups.- Compact Lie Groups and Maximal Tori.- The Compact Group Approach to Representation Theory.- Fundamental Groups of Compact Lie Groups.- Appendices. Brian Hall is Professor of Mathematics at the University of Notre Dame, IN.